Research support for this story was provided by the Investigative Fund of The Nation Institute. Published in conjunction with The Nation. IN THE CLINTONS’ PURSUIT OF POWER, there is no such thing as a strange bedfellow. One recently exposed inamorato was Norman Hsu, the mysterious businessman from Hong Kong who brought in $850,000 to Hillary Clinton’s campaign before being unmasked as a fugitive. Her campaign dismissed Hsu as someone who’d slipped through the cracks of an otherwise unimpeachable system for vetting donors, and perhaps he was. The same cannot be said for the notorious financier Alan Quasha, whose involvement with Clinton is at least as substantial–and still under wraps. 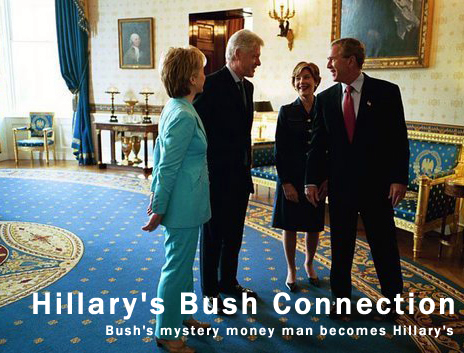 Political junkies will recall Quasha as the controversial figure who bailed out George W. Bush’s failing oil company in 1986, folding Bush into his company, Harken Energy, thus setting him on the path to a lucrative and high-profile position as an owner of the Texas Rangers baseball team, and the presidency. The persistently unprofitable Harken–many of whose board members, connected to powerful foreign interests and the intelligence community, nevertheless profited enormously–faced intense scrutiny in the early 1990s and again during Bush’s first term. Now Quasha is back–on the other side of the aisle. Operating below the radar, he entered Hillary Clinton’s circle even before she declared her candidacy by quietly hiring Clinton confidant and longtime Democratic Party money man Terry McAuliffe at one of his companies. During the interregnum between McAuliffe’s chairmanship of the Democratic Party and the time he officially joined Clinton’s campaign, Quasha set McAuliffe up with a salary and opened a Washington office for him. Just a few years earlier, McAuliffe had publicly criticized Bush for his financial dealings with Harken, disparaging the company’s Enron-like accounting. Yet in 2005 McAuliffe accepted this cushy perch with Quasha’s newly acquired investment firm, Carret Asset Management, and even brought along former Clinton White House business liaison Peter O’Keefe, who had been his senior aide at the Democratic National Committee. McAuliffe remained with the company until he became national chair of Hillary’s presidential bid, and O’Keefe never left. McAuliffe’s connection to Quasha has, until now, never been noted. Another strong link between Quasha and Clinton is Quasha’s business partner, Hassan Nemazee, a top Hillary fundraiser who was trotted out to defend her during the Hsu episode–in which the clothing manufacturer was unmasked as a swindler who seemingly funneled illegal contributions through “donors” of modest means. In June, by liquidating a blind trust, the Clintons sought to distance themselves from any financial entanglements that might embarrass the campaign. Clinton spokesman Howard Wolfson argued that the couple had gone “above and beyond” what was legally required “in order to avoid even the hint of a conflict of interest.” But throughout their political careers, Bill and Hillary Clinton have repeatedly associated with people whose objectives seemed a million miles from “a place called Hope.” Among these Alan Quasha and his menagerie–including Saudi frontmen, a foreign dictator, figures with intelligence ties and a maze of companies and offshore funds–stand out. Ideology does not seem to be the principal issue driving either Quasha or Nemazee. Nemazee backed the likes of archconservative Republican senators Jesse Helms, Sam Brownback and Al D’Amato before moving aggressively into the Democratic camp. Quasha, frequently identified as a Republican fundraiser, gave to both Bush and Al Gore in 2000 and so far in the 2008 race has given to Republicans Mitt Romney and Rudy Giuliani as well as Democrats Barack Obama and Chris Dodd, in addition to Hillary Clinton. But Quasha’s concerted efforts to get into Clinton’s inner circle are reminiscent of his relationship with a pre-Governor Bush. A student at Harvard’s business school at the same time as Bush, Quasha was a little-known New York lawyer when he took over the small Abilene-based Harken Oil in 1983, using millions from offshore accounts held in the name of family members. Quasha’s now-deceased father, Manila-based attorney William Quasha, was known for his close friendship with Philippine dictator Ferdinand Marcos and his ties to US intelligence; he was also a member of the “Eagles Club” of major GOP contributors. In 1986 Alan Quasha embraced a struggling George W. Bush, rescuing his failing Spectrum 7 oil company, folding it into Harken Energy and providing Bush with a directorship, more than $600,000 in stock and options and a consulting contract initially valued at $80,000 a year (which was raised in 1989 to $120,000). The financial setup allowed Bush to devote most of his time to the presidential campaign of his father, a former CIA director who as Vice President was the Reagan Administration’s overseer of a massive outsourcing of covert intelligence operations, and who had his own warm relationship with Marcos. Harken’s financials were famously complicated. Reporters from top publications like the Wall Street Journal, Time and Fortune went at Harken with zest, but they ultimately failed to unravel all its labyrinthine activities. In 2003 Harken was described in the trade publication Platt’s Energy Economist as “a toxic waste dump for bad deals, with a strong odor of US intelligence spookery and chicanery about it.” Indeed, the company was kept afloat by an all-star cast of financiers with ties to BCCI, Saudi intelligence, the South African apartheid regime, Marcos and the Shah of Iran. The company perennially lost money for ordinary investors while benefiting insiders like Bush, Quasha and Nemazee. Indeed, Harken has lost money nearly every year since Bush’s days there, piling up cumulative losses in the hundreds of millions. What does emerge is a complex pattern of personal and financial relationships behind Harken’s sudden good fortune in the Middle East, raising the question of whether Bahrainis or others in the Middle East may have hoped to ingratiate themselves with the White House. Even more intriguing, there are numerous links among Harken, Bahrain and individuals close to the discredited Bank of Credit & Commerce International, a banking empire that used Mideast oil money to seek ties to political leaders in several countries. Thanks to his income from Harken, Bush was able to become managing partner of the Texas Rangers–a glamorous and highly visible sinecure that would eventually earn him nearly $15 million and make him a credible front-runner for the Texas governorship. This rescue and makeover of a ne’er-do-well son was a key step in W.’s path to political power. As his co-chair in the private firm, Quasha chose his old friend Nemazee, a fellow Harken investor. By the time of the Carret acquisition, Nemazee, a founding member of the Iranian-American Political Action Committee whose family was close with the late Shah of Iran, had become a significant fundraiser for the Clintons and the Democratic Party. In 1995 he raised money for the DNC. In 1998, in the midst of the Lewinsky affair, Nemazee collected $60,000 for Bill Clinton’s legal defense fund in $10,000 increments from relatives and friends. Clinton subsequently nominated Nemazee as ambassador to Argentina but withdrew the nomination after an article in Forbes raised questions about Nemazee’s business dealings in the 1980s and ’90s–which noted that the American-born Nemazee magically became “Hispanic” by acquiring Venezuelan citizenship because of a requirement that certain California public pension funds be run by minorities. Failure to be named ambassador did not, however, hamper Nemazee’s rise within the Democratic Party. By 2004 he was New York finance chair for John Kerry’s campaign, and in 2006 he served under Senator Chuck Schumer as the national finance chair of the Democratic Senatorial Campaign Committee (DSCC)–a period during which the committee raised about $25 million more than its Republican counterpart. This past March Nemazee, at the behest of McAuliffe, threw a dinner for Hillary at Manhattan’s swank Cipriani restaurant, which featured Bill Clinton and raised more than $500,000. But the office seems to have benefited McAuliffe–and Hillary Clinton. When McAuliffe stepped down as DNC chair in February 2005, he said he planned to hit the lecture circuit and spend more time with his family. He may have done both, but he did so as vice chair of Carret from the new company office on the seventh floor of the venerable McPherson Building, once the home of the John Kerry campaign and just off K Street’s lobbyist gulch. Simon Rosenberg’s New Democrat Network, where Mark Penn, chief pollster and strategist for Hillary’s campaign, has served as a fellow, was housed next door to McAuliffe and O’Keefe. While there, McAuliffe found time to pen his memoir, What a Party!, his paean to the Clintons and his role in raising record amounts of money for them and the party. Yet the memoir itself, for which he earned a seven-figure advance, makes no mention of Carret or his role as its vice chair. Three people working in nearby suites said they remembered McAuliffe and O’Keefe working out of the office, but none of them remembered the Carret name. Nor did any of them have any idea what McAuliffe was doing as Quasha’s vice chair. One person who visited McAuliffe in the suite recalled that he was working on his book but said he was unaware of the official function of the office. “Terry holds his cards pretty close on his business activities,” he said. According to another visitor, McAuliffe was using his time to lay the groundwork for Hillary’s long-anticipated presidential bid. With McAuliffe leading Clinton’s ravenous fundraising operation, the possibility that Carret’s Washington office was opened up, at least in part, to serve just such a function is bolstered by the fact that Carret opened the office only after hiring McAuliffe–and closed it down once he left. During that period, though no Clinton campaign committee yet existed, there were signs that he was already operating on her behalf. In 2005 he appeared on CNN’s Crossfire, where the former Democratic chief did not bother to feign neutrality in the primaries: “Personally, I hope she runs,” he said. “We would be lucky if she did run, I’ll tell you that.” In 2006 he kept one foot in Clintondom as a member of the Clinton Global Initiative, an organization whose membership is primarily by invitation to elite business leaders. Wang, whose China International Industry and Commerce partnered with Carret soon after McAuliffe joined the company, was also named to the initiative in 2006. Meanwhile, during McAuliffe’s employment at Carret, Quasha himself donated large sums to the DSCC. He gave $26,700 in June 2006 and $25,000 that October and also personally contributed $4,600, the maximum allowed, to the Hillary Clinton presidential exploratory committee. Since his start as a young fundraiser on Carter’s 1980 re-election campaign, McAuliffe has consistently melded politics, policy and private enterprise. By the time he was 30, he had launched a dozen companies, his own law firm and numerous venture capital companies. Perhaps his most controversial association was with the telecommunications company Global Crossing, where McAuliffe managed to turn a $100,000 personal investment into an $18 million windfall. After McAuliffe sold his shares and got out, the company collapsed; nearly 10,000 employees lost their jobs, and investors lost $54 billion. McAuliffe defended the firm’s top executives, who were close with both the Bushes and Clintons, but went on to attack President Bush for similar patterns at Harken. At a DNC meeting in Las Vegas in 2002, McAuliffe spoke about the recent collapse of Enron and questioned whether Bush could “restore confidence to Wall Street when he has engaged in the same practices he condemns today,” a reference to Bush’s Harken profiteering. That same year, associates of McAuliffe, fronted by a fake grassroots organization, released an aggressive ad campaign seeking to highlight the Harken-Bush connection. It is not surprising, then, to learn that neither McAuliffe’s connection to Carret nor Quasha’s role in the firm have been widely publicized. Carret employees said they were surprised that when Quasha acquired the prestigious firm he did not choose to publicize his coup, instead keeping it quiet. In fact, the company’s website does not reveal his role as chair–or much of anything about the firm. The company’s chief financial officer, Marco Vega, said he was unable to provide details on Quasha’s role in the company, or even to confirm his current title. But a vice chair is much more than just an adviser, and Carret’s opening an office off K Street was not a casual gesture. Notably, though the DC office was closed after McAuliffe left for Hillary’s campaign, McAuliffe protégé O’Keefe has stayed on as Carret’s managing director for marketing–providing Quasha with an ongoing pipeline to the Clinton operation. With an international man of mystery like Quasha, it’s nigh impossible to definitively identify his endgame. But one thing he seems to have a stake in is free rein for hedge funds–and preservation of the low rate at which their profits are taxed. In 2005, while McAuliffe was on his payroll, Quasha traveled to Bermuda to speak at the MARHedge World Wealth Summit, which addressed the topic “Hedge Fund Management in a Perilous Investment Climate.” McAuliffe, too, weighed in on the well-being of hedge funds as the featured speaker at a 2006 investors’ conference of the Carret unit Brean Murray, Carret & Co., where, according to advance publicity material, he planned to address the “current political debate in Washington, DC and its impact on Wall Street and the status of potential further hedge fund regulation.” Also indicative of an interest in influencing hedge fund policy is the presence on Carret’s International Advisory Board of Philippa Malmgren, who served as George W. Bush’s liaison to the financial markets, and who often speaks and writes on politics and policy related to hedge funds. According to the Center for Responsive Politics, Hillary Clinton, whose daughter, Chelsea, works for a hedge fund run by a prominent Democratic donor–came in second only to Joe Lieberman in cash raised from hedge fund managers during the 2006 election cycle. She has belatedly and reluctantly joined other presidential candidates in calling for a change in the law so that fund managers would pay taxes at the same rate as everybody else. Clearly, her supporters among hedge fund figures have much to gain by electing a President who feels Wall Street’s pain. Whatever Carret’s overall objectives, the company is on the march. “We’ve taken the Brean Murray and the Carret platforms and expanded them into China, India, Eastern Europe and Russia, and we will be doing so in Latin America as well,” Nemazee said in a 2006 interview with Leaders magazine.